Immunizations are an important part of keeping your pet safe and healthy. We recommend starting a vaccine series, as well as deworming, at 8 weeks of age. Vaccines need to be boostered at regular intervals to help protect your pet from diseases. For more information see our FAQ section on What shots does my puppy/kitten need? Wellness exams are a critical piece in maintaining your pet's good health. Pets on average age 7 years to one calendar year. Because pets age more rapidly than us, it is important to have your pet examined a minimum of once every year. We offer a full line of products to combat parasites. Annual testing (or as needed if problems arise) for internal parasites is the best way to determine what medicine is needed to properly deworm your animal. Don't forget about preventing heartworms (click to see the FAQ section on heartworms for more info)! It is an important part of maintaining your pet's health. We offer a wide variety of surgical services ranging from soft tissue to orthopedics. Please see our section on surgical services for more information. Just like you, your pet needs dental care. If we find signs of disease, we will recommend a treatment plan specific to your animal. It is important for the overall health of your pet that we take care of any dental problems. We will recommend a home care plan that is a key part of keeping your pet healthy, as well as scheduling annual dental check ups and cleanings. 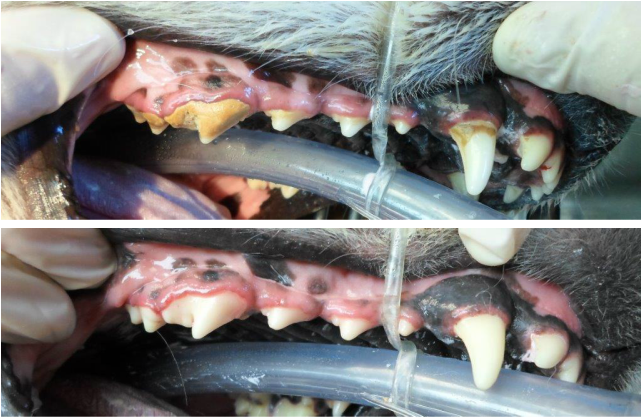 Also talk to us about what you can do to prevent dental disease in your pet. A great Before and After picture of a dental patient. Results everyone can see and appreciate!! Microchip identification is a permanent and unique code assigned to your pet that helps to bring them back to you if they are ever lost or stolen. A microchip is approximately the size of a grain of rice and is implanted under the skin with a needle to give your dog identification that travels with them everywhere, even if they slip out of their collar. Alpine Animal Hospital is equipped with in-house lab equipment, Digital X-ray equipment, and an Ultrasound. These features allow us to obtain a quicker diagnosis when treating your pet. We offer Mixed Breed DNA testing through Wisdom Panel MX. This testing can answer the question every mixed breed dog owner wants to know - What breed(s) is my dog? We have a full line of Science Diet products as well as prescription diets for dogs and cats with special nutritional needs. We also have special prescription diets from other manufacturers, such as Purina and Royal Canin.